The main fähre Phuket Koh Phi Phi runs from the south east corner of Phuket Island from the Phuket town port at Rasada Pier. It primarily offers day time crossings in the morning and the early afternoon which start at 08.30 in the morning and finish at 14.30 in the afternoon. The fähre Phuket Koh Phi Phi is the main route from one of Thailand's most popular resort destinations to one one of Thailand's most celebrated. Phi Phi Island is a series of 6 islands and large rock cliffs (5 uninhabited) that was used in the movie The Beach, starring Leonardo Di Caprio and set on the wonderful Maya Bay of Phi Phi Ley. Most of the morning ferries are full of one day tour sightseers who go to enjoy a day amongst one of nature’s true gems. The limestone cliffs are covered in jungle vegetation and sweep down majestically to golden sand beaches and then plunge down further into an aquamarine sea full of reef and coral. Phi Phi Island has 20km of snorkeling reef. The fähre Phuket Koh Phi Phi takes you out of the old fishing port past many boats from China, India Burma and further afield past the hill promontories of Phuket out towards Maiton Island. 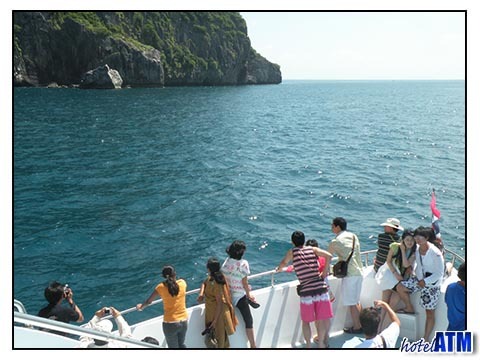 As you gaze about you see over one hundred small and larger islands and rock formations. It really is a pretty sight. Within 10 minutes you first catch a a glimpse of Phi Phi Island cliffs poking up over the horizon. This really is a fähre journey like no other. 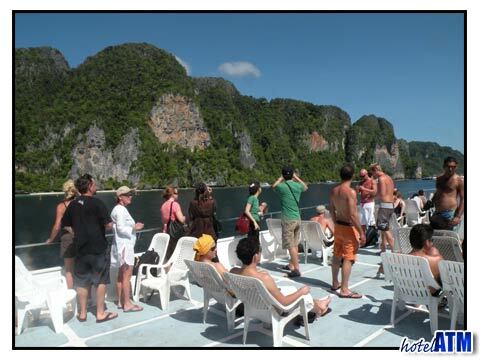 The fähre Phuket Koh Phi Phi schedule is dominated by the 7 boats that leave Rasada Pier at 08.30 in the morning and return to Rasada at 16.30. The passenger numbers can make the pier quite busy for a while but once every one is on their respective fähre, the mood calms down and people settle in to enjoying their cruise out to the islands. I prefer the left side of the boats as the views are a little bit better but if you want to go on deck you can roam around and enjoy all the sights. The 13.30 and 14.30 fähre from Rasada Pier start the morning on Koh Phi Phi. These are smaller fähre than the 08.30 ones and are often full of local islanders going to market on Phuket or tourist transferring to get the hourly flights after 13.00 up to Bangkok. The Fähre Phuket Koh Phi Phi schedule is daily throughout the year. However the fähre do stop very occasionally now for maybe one day a year due to storms. This is very rare now as the fähre are a lot larger than they were pre 2005. The windy and stormy weather can come through in the June and September monsoons and although there can be a lot of sunny weather there is nearly always a steady wind. See weather. The fähre Phuket Koh Phi Phi go to Phi Phi Don Pier but he main luxury resorts of Zeavola Phi Phi Resort, Holiday Inn Phi Phi Island and Outrigger Phi Phi Island Resort and Spa (previously Phi Phi Island Village Resort And Spa)are on the north and east beaches of Laem Tong and Loh Bagoa. As the fähre gets to the main pier guests of these resorts are met by their respective representatives and transferred onwards by their own private launches. Many of the fähre Phuket Koh Phi Phi tickets include transfers from the main Phuket beaches on the west coast of the island. Typically the pickups at Patong, Karon, Kata, Bang Tao, Kamala, Surin are from 7.00 to 7.30 am at the reception of the resort. There is more fähre information at the Phuket to Phi Phi Transport page including articles on "Phuket Phi Phi timetable", "How much is the boat to Phi Phi Islands", "Koh Phi Phi ferry times", "Phi Phi Pier", "How long does it take to Phi Phi? ".